There’s something odd about this. No, not this particular bread but the situation around it. You see, Punkin hates bananas but LUUUVVVVS banana bread. So it’s a rare occasion when I do buy bananas since I know they’re rather disliked. A lot. I’m told it’s the texture and/or the smell. And some excuse about humans having evolved passed them… or something. I’m sure he’s joking. (I think.) Hey, I can live without bananas if it will keep Punkin happy. So this week, I decided to pick up some bananas because I just had a hankering. However, I bought five that were, well, riper than I was expecting, I wanted to put them on cereal or in a PB&B sammich but they decided to go brown on me rather soon. No prob! 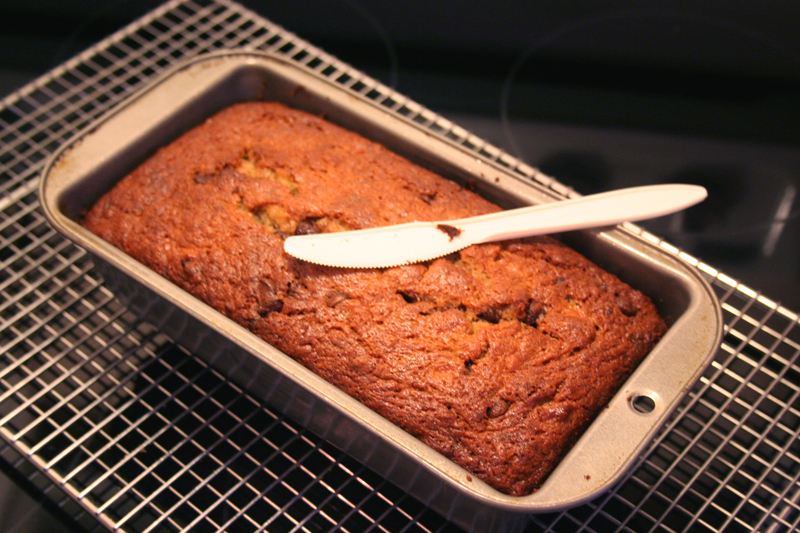 Because there’s a great Banana Bread Recipe online over at the Fresh Loaf. I’ve made it before and, in spite of finding bananas gross, Punkin will eat this bread up like nobody’s business. I don’t ask. Cause I have even more “I don’t likes” myself (I blame it on my mother’s terrible cooking skills) so it’s a decent trade off from my end. No green peppers on my stuff, no nanners in the house, 99% of the time. And usually when they do make it past the front door, some Nanner Bread comes out of the deal. Like now. As it’s been a long while since I made it and I’ve never done a Step-By-Step of the process, I figured this was a good time to do so. Go grab the recipe linked above (there’s a “printer friendly” link near the bottom) and follow along. 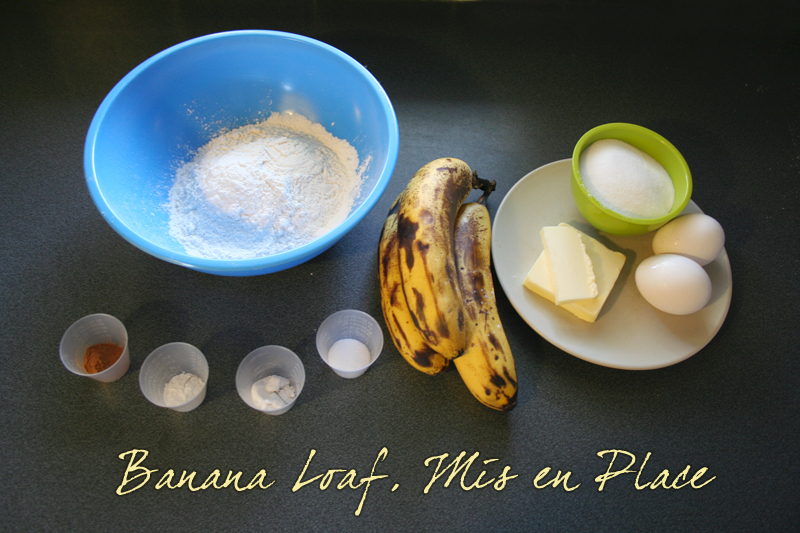 If you happen to have two or three ripe nanners at hand, it’s a seriously quick bread so you could probably mix it up as I go. Seriously, the “10 minute” claim isn’t off the mark (unless you’re also taking photos and need to make the process somewhat presentable. Then it may take 15. Oh and in case anyone’s wondering, this isn’t part of the BBA Challenge, just a little side trip. 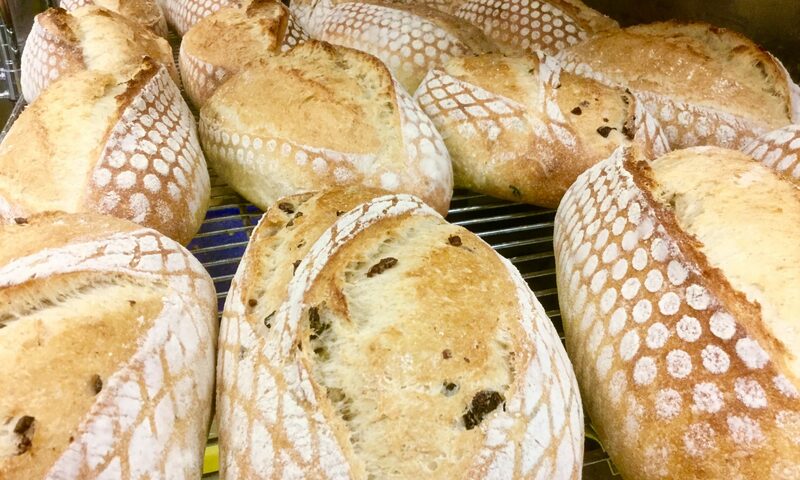 Enough jig-jab, let’s get baking!! As you can see, not exactly exotic in the ingredients list. 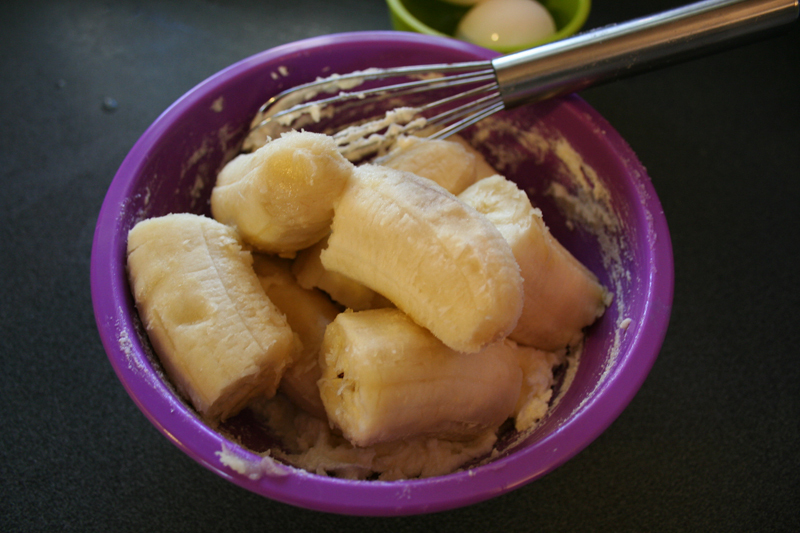 Flour, cinnamon, baking powder, baking soda and salt for the dry ingredients, three ripe bananas, room temp butter and room temp eggs and sugar for the wet. You’ll also need to have ready a loaf pan or two,I made this in an 8.5 X 4.5″ pan (greased) but it can be made in two smaller “1 pound” loaf pans. There’s also a surprise ingredient not shown here. So start the clock and let’s see how close it ends up to 10 minutes. Note: “Hunting for ingredients” is not included in the total time since there’s a possibility a run to the store is needed and that would totally fudge up the outcome! OK, before I go further, a Pro Tip: Use a bigger bowl than this! I wasn’t thinking when I grabbed it. First thing I did was I creamed the butter and sugar. Although Floyd’s recipe says he skips that step, I decided to go ahead and do that anyway. 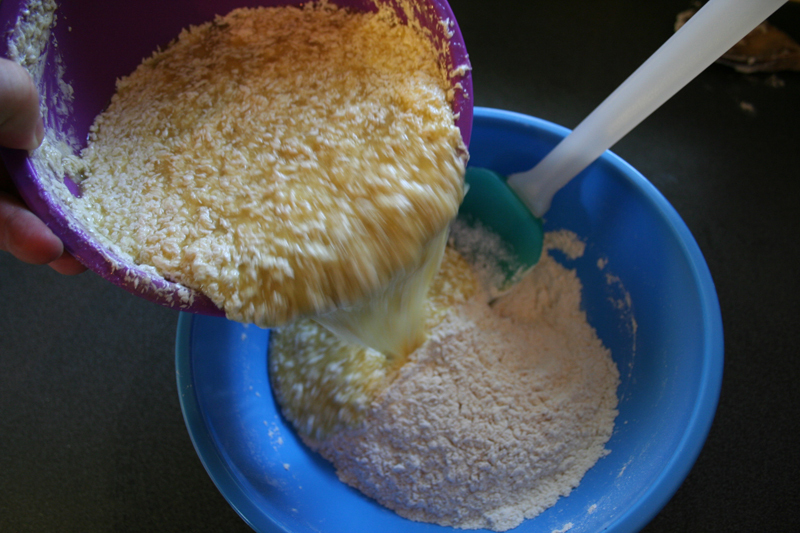 Seems both methods will wok, one’s easier on your arm though unless you decide to mix all this in your stand mixer or with a hand mixer. So many possibilities. 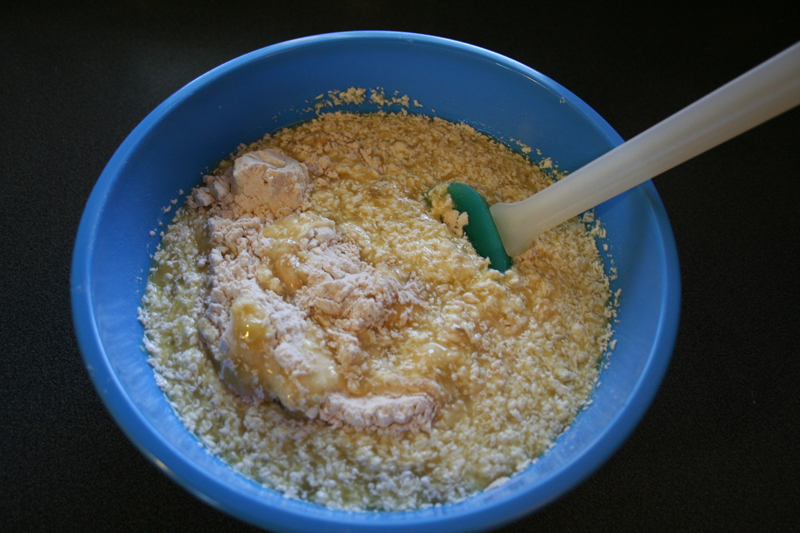 Or just skip it and roughly mix the sugar and butter together. WAIT, I lied: The FIRST first thing I did was turn the oven on to 350ºF; remember this batter will be ready in about 10 minutes (we hope) so fire that baby up early! You may start to see why a bigger bowl would have been a wiser move. 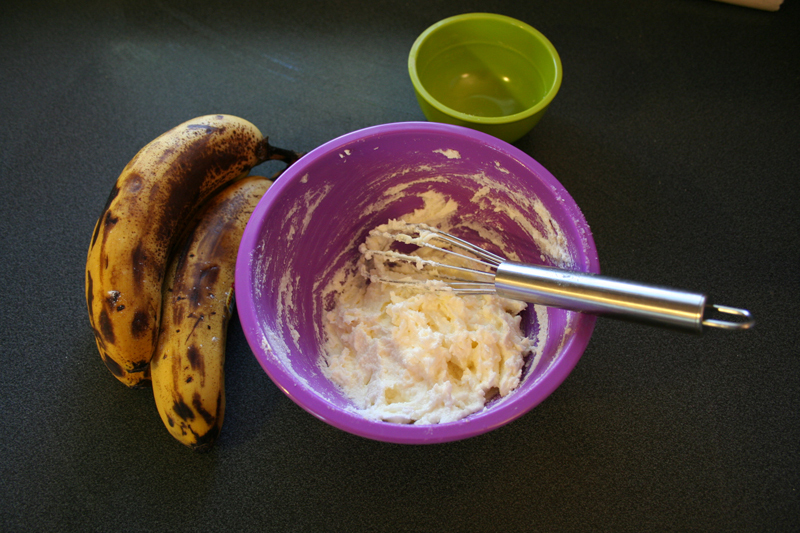 I add the three bananas and mash. I used the whisk, it worked ok. It might have been easier to use a potato masher. Or if I was using an electric mixer, that. But it got done anyway. 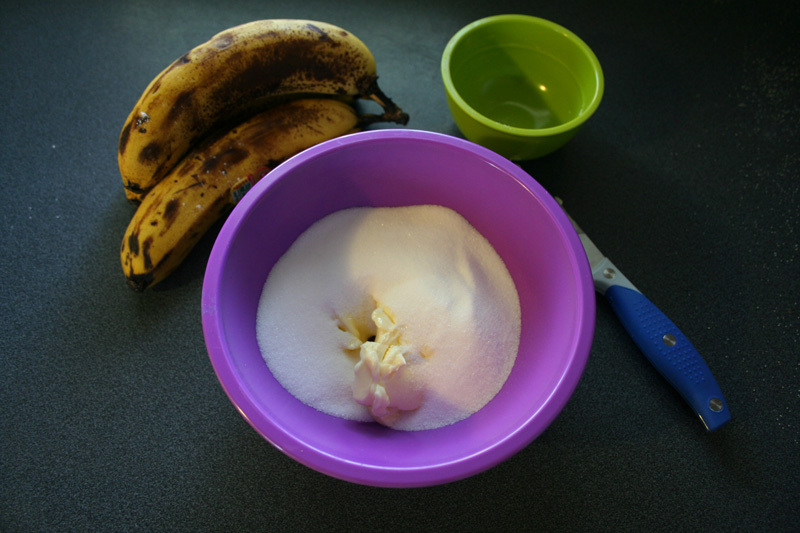 I also might have been wiser to put the creamed sugar in another bowl, mash the bananas then add it back. Oh well. As long as the end result is the same. 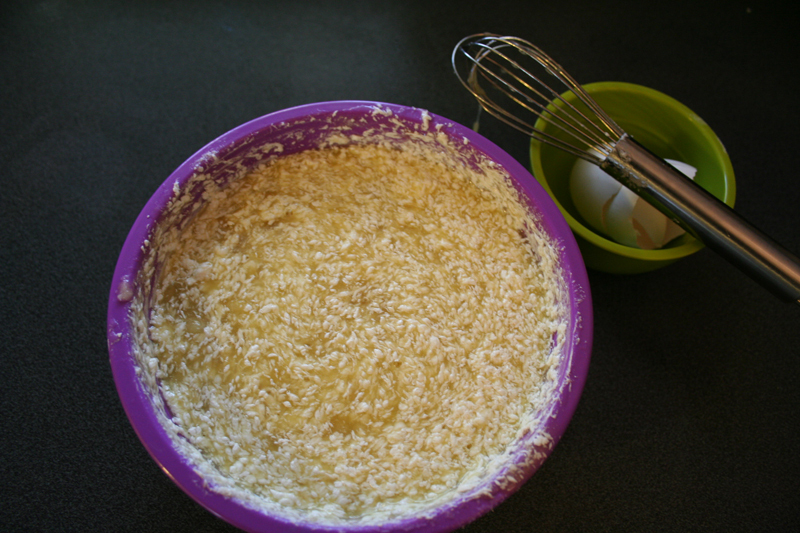 Mash mash, mix mix. 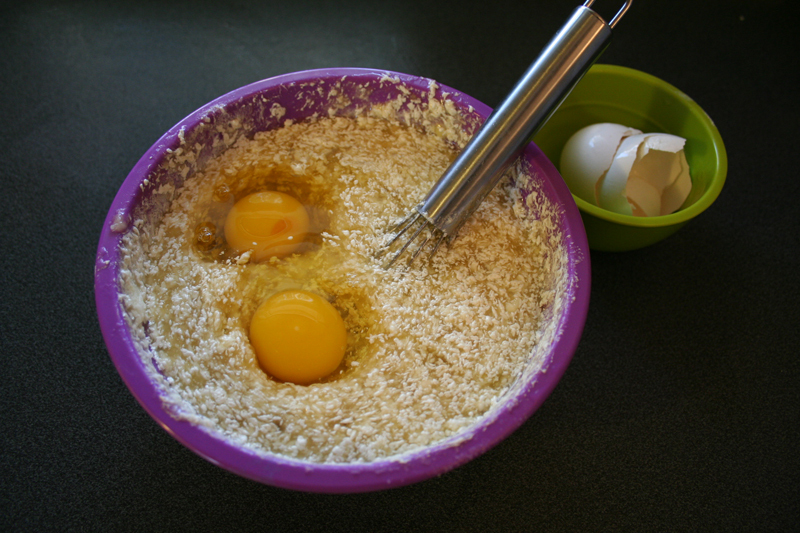 Finally, we add the room temp eggs and mix them in until everything is well blended. A little tricky deal here in such a small bowl but we managed without spilling much at all. And that, dear friends, ends the Wet Ingredients section. How are we doing on time? 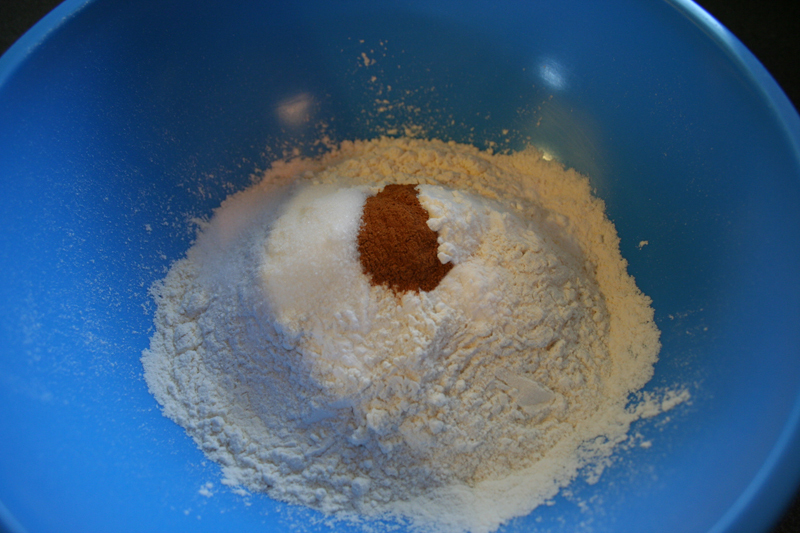 Dry Ingredient section: Put the small dry stuff into the (larger) bowl with flour and mix. This ends the Dry Ingredients section. NOW how are we doing on time? Next, we mix the wet and dry together. 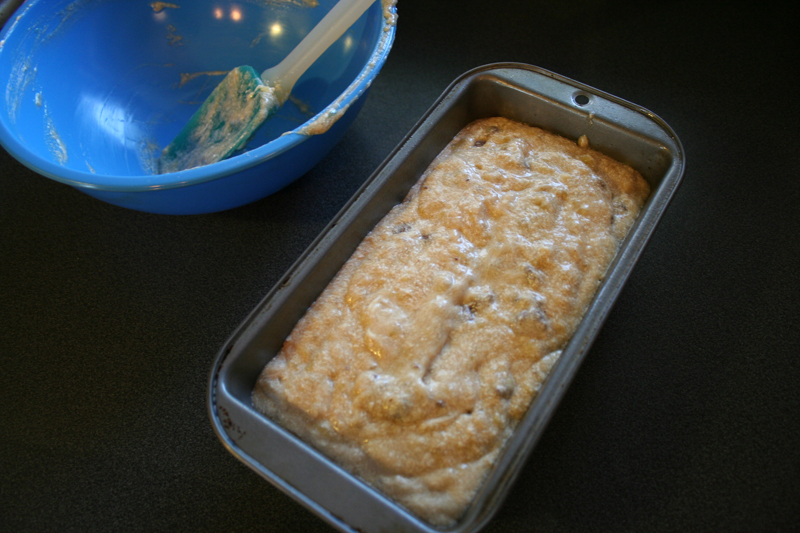 Finally, I pour the batter into a greased (well, Pam-spayed) loaf pan. It is, as already noted, 8.5″ X 4.5″, a little smaller than my other pans (9″ X 5″) but the recipe says you can also make it in smaller pans still. I don’t have any of those. 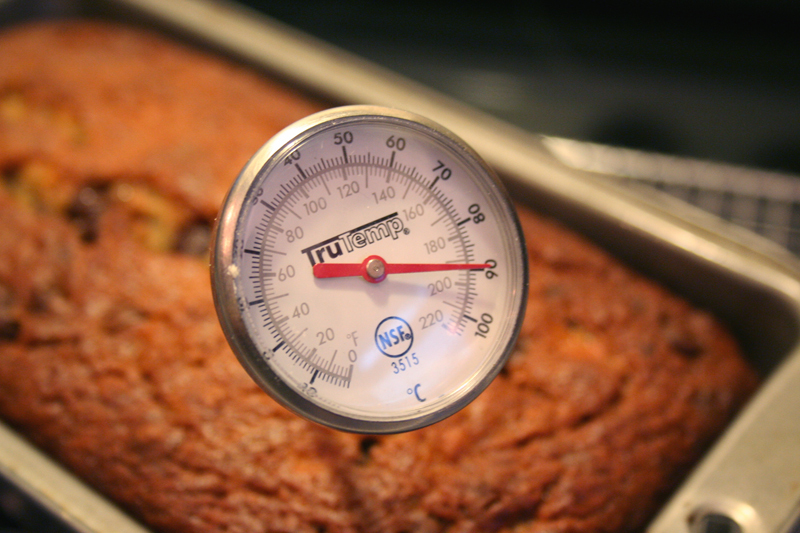 So off into the 350ºF baking inferno this puppy goes, set the timer for 50 minutes. Aaaaaanddd… TIME! Are we near 10 minutes? Under maybe? All that’s left now is to wait and see how it’s doing in about 40-50 minutes. And clean up the dishes which aren’t that overwhelming. After the loaf has cooled a few minutes, I take a cheap-o plastic knife and run it around the edges. Why a plastic knife? Simple: to avoid scarping into the pan. As I type this, I’m still waiting for the loaf to cool and cut a slice. Tip: Don’t use Pam (type) spray oil as your pan release. While I was trying to un-pan the loaf, the bottom had quite securely stuck to the pan and a fair bit of it remained on the pan as the rest of the loaf came out. This is in spite of the pan being teflon-coated (and yes, still in good condition) and a fairly liberal use of Pam spray. My advice is to use either oil or shortening or better yet, a proper Pan Release, to coat the pan. I should have, I was just going the easy/lazy route. I will write up a simple pan release recipe that a lot of pro bakers who make cake trust and count on, it’s crazy simple and can sit in the cupboard almost indefinitely. Here’s the link to that very simple Pan Release recipe blog entry. 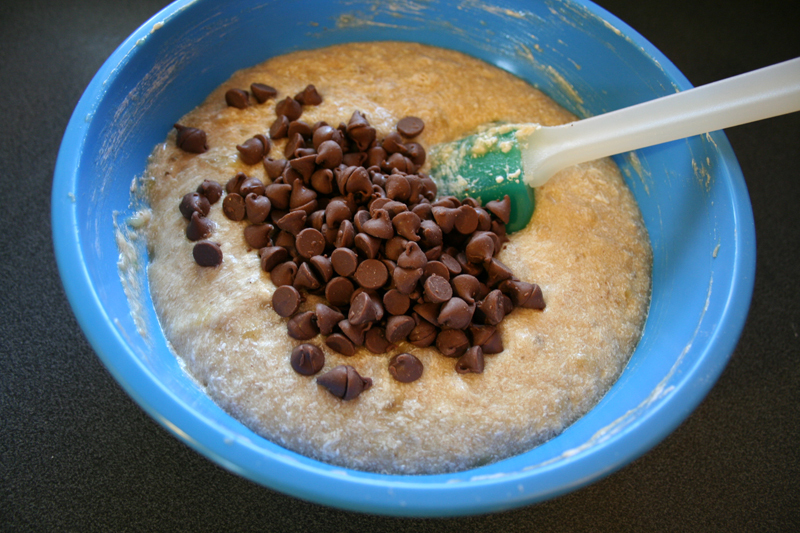 It’s delicious, the chocolate chips are a nice add on but NOT at all mandatory. This quick loaf has been made “straight up” before and still passes the Punkin test. And if Punkin likes it, so will you and your little monkeys.